A second-generation butcher, Jeff Farron has had his hands busy in the meat industry since before he was a teenager. He has been skilled and knowledgeable in the Butcher trade for over 30 years, and has become a familiar fixture of the neighborhood for more than a decade. An expert in his field, he has learned a lot and he passes that knowledge on to his customers. Jeff isn't just a butcher. He is a fountain of information which he shares freely with those who ask for his help -- and he gets a lot of questions! From recipes to cooking advice, there are no secrets from behind the counter. Need a suggestion? Jeff has a lot to offer. From recipes to prepared entrees to cooking recommendations, your needs are covered. Want something different? There is always a wide selection to choose from and Jeff can has a lot of ideas on how to take your everyday meal out of the ordinary. A familiar face in the neighborhood, Jeff knows his customers and the value they expect. His customers come from all over the county for his personal service, friendly advice and top quality products. 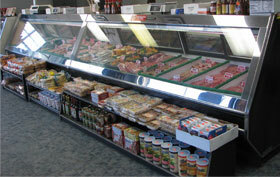 Once you have experienced Jeff's Fresh Meats, you won't want dinner from anywhere else.